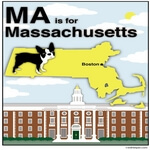 This section lists reading comprehensions on edHelper.com with references to the state of Massachusetts. These reading comprehensions were not written specifically for the state theme unit. Is It Mintonette or Volleyball?